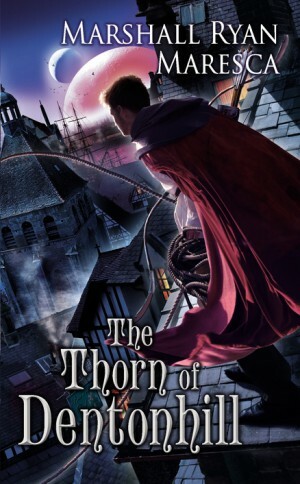 Maresca’s The Thorn of Dentonhill is the first novel set in the author’s Maradaine world. It is, for the most part, a well-conceived and well-written melange of popular fantasy sub-genres: there’s a university with a magic department, there is some vigilante derring-do and thievery. I had a couple of minor issues, but mostly this was an enjoyable, quite fun start. I’m going to deal with the issue right away: Maresca wants to give his characters something of an olde English colloquialism. This is fine, and certainly de rigueur for a great many writers of fantasy. However, Maresca gets some of the terminology mixed up – not enough to derail the story, but enough to make this Brit twitch on occasion. It’s such a silly thing to pick up on, but when using the words “bloke” and “mate”, it’s really important that you use them correctly – in 90% of instances, the author got them the wrong way around. As I said, a nit-picking issue, but it was there. Otherwise, this is a pretty interesting novel. As I’ve mentioned, it offers a mixture of sub-genre elements. The university, not exclusively magic-oriented, was an interesting place to have the protagonist based. His adventures and extra-curricular activities are not centred around the university and his classes (although, they can’t help but become involved later on), which means we get to explore the city with him and his accomplices (willing and not). The characters’ motivations are clear and believable, although not as developed as they could have been. Some of the side-characters were really strong, though, which meant they never felt merely like props. The complex network of street gangs that have carved up the city was interesting, too, and how the kingpin on one side has cowed the others only to be challenged by the Thorn is an interesting development. Perhaps if all of these elements had been introduced over the course of a couple of books, we might have been able to get a better feel and picture of the world and metropolis’s politics. Some elements remained underdeveloped. In order to give readers the information they needed for the story, however, Maresca indulged in a just a bit of info-dumping and telegraphing. Given that the next novel in the series does not focus on those characters central to The Thorn of Dentonhill, hopefully he’ll take a Pratchett-esque approach to the series and world, writing a number of series-within-a-series, which will allow for greater and smoother world building as we go along. I’m certainly interesting in reading more, and am quite looking forward to A Murder of Mages. If you’re looking for an action-and-adventure-filled new fantasy series, then The Thorn of Dentonhill will suit very well. There are a couple of book one niggles, but I’d still recommend giving it a try.